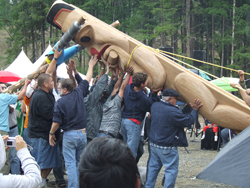 The Kitselas Canyon National Historic Site is located 10 km east of the City of Terrace. Surrounded by natural beauty the Kitselas people have occupied the area for over 5000 years. Known as the ‘toll keepers’, the Kitselas guarded the Canyon with a fortress. When the pioneer settlers arrived by sternwheeler in the 1860, Kitselas Canyon was a physical obstacle where the goods destined for communities upstream were offloaded and transported around the canyon by tramline and wagon. 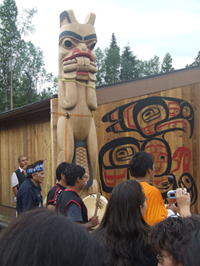 Today the National Historic Site is open and consists of four long houses with an array of educational installations, Aboriginal motifs and totem poles. There is also an interpretive nature trail that leads to the petroglyphs and Ringbolt island.